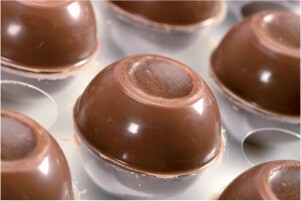 For truffles with shells, it is best to use a soft ganache. See for the cream ganache formulas for softer ganache. The ganache for filling truffle shells should be cooled to 86&F/30.0&C for milk chocolate shells, 84&F/28.8&C for white chocolate shells, or 88&F/31.1&C for dark chocolate shells, because if the ganache is too warm, it will melt the shells. Place a filling tray for truffles on top of the truffle shells. Ensure that the holes of the filling tray are aligned with the shell holes. Using a disposable pastry bag with the end snipped off, pipe the ganache into the shells. Make sure to keep the pastry bag halfway into the shells while piping the ganache, and overfill the shells to ensure there are no air bubbles inside the truffles. Air bubbles will cause mold to form. Immediately after filling the shells, scrape the excess ganache off the tray using as little movement as possible. Movement will create more crystals, making it difficult to pipe the ganache back into the shells. Set the filled truffles aside to rest for a day at room temperature (68&F/20.0&C) to allow the ganache to fully crystallize. 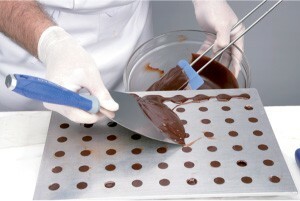 Once the ganache has fully crystallized and reduced in size, use a slightly warmed capping tray and slightly overwarmed couverture to cap the truffles. Spread the couverture back and forth over the tray. (This will prevent the couverture from setting immediately. – Pipe the ganache into shells. 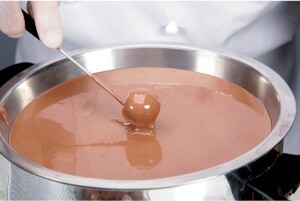 – Immediately after filling the shells, scrape the excess ganache into a bowl. – Rested, fully crystallized ganache, ready to be capped. 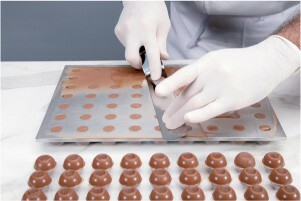 – Use a warmed capping tray and slightly overwarmed couverture to cap the truffles. – Dip the truffle in tempered couverture with a round dipping fork. – Place the finished truffles in a tray to hold and store. Using overwarmed couverture will allow the caps to meld into the shells.) Roll the truffles on the cooling tray to fully meld the caps and shells and prevent the caps from tearing off of the truffles. Using a round dipping fork, dip each truffle in tempered couverture and set aside on a cooling tray. 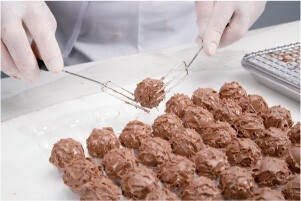 Once the couverture begins to set, roll the truffles quickly over a wire cooling rack to create spikes. Too much rolling will cause the couverture to overcrystallize and will turn the couverture spikes dull. It is nice to see some shiny empty space between the spikes. Immediately place the truffles in an empty shell tray.